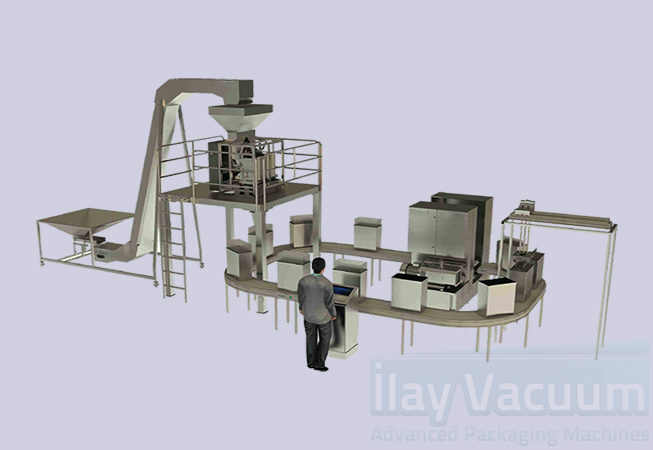 Patent protected and fully customized fully automatic IL 2023 model vacuum packaging line can vacuum pack the products that 5 kgs -50 kgs of pinto beans, beans, chickpeas, the agriculture and field crops in general, walnuts, hazelnuts, peanuts, macadamia, pecan, shell nuts, white flour wheat, various spices, all kinds of coffee, coffee beans, cashews, almonds, 3-6 ton per hour. The process doesn’t need operator touch. 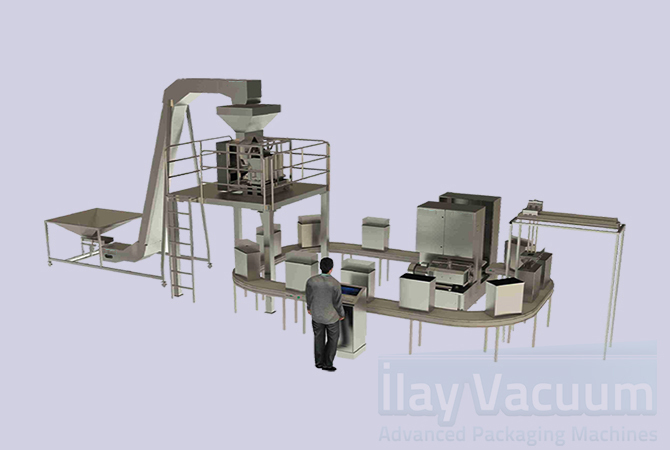 The IL 2024 model combines the transferring robot, elevetor, conveyours, filling unit, and automatic vacuum machine. All the equipments are working simultaneously with PLC software. We customize the conveyours, filling unit, elevator, transferring robot and the automatic vacuum machine according to customer expectations, needs and sizes. Depending on the speed and flow of production, it can be easily and practically combined with previously installed modular conveyor belt. Automatically fill and vacuum pack about 3-6 tons per hour. All our equipments have CE conformity and food conformity According to the rules and requirements. The automatic line reduces the of costs and expenses of operators, time and energy to maximum time savings. Saves the transfer costs and transportation expenses.